Inside Scientology NPR coverage of Inside Scientology: The Story of America's Most Secretive Religion by Janet Reitman. News, author interviews, critics' picks and more. Traces the story of the fast-growing religion while addressing such controversies as the organization's attacks on psychiatry, its celebrity support, and its steep tithing requirements. July 23, 2011  The author spent more than five years writing and researching her book, Inside Scientology: The Story of America's Most Secretive Religion. It gives a detailed account of the lives of founder L. Ron Hubbard and the man who succeeded him, David Miscavige. On a hot July morning several years ago, I was approached by one of these clear-eyed young men. "Hi!" he said, with a smile. "Do you have a minute?" He introduced himself as Emmett. "We're showing a film down the street," he said, casually pulling a glossy, postcard-sized flier from the stack he held in his hand. "It's about Dianetics — ever heard of it?" The room appeared to be set up as a Scientology museum. Books by Scientology's founder L. Ron Hubbard — more than fifty of them — lined the walls, as did black-and-white photos of the man, all presenting him as a robust patriarch with graying sideburns and a benevolent smile, dressed in a sports jacket and ascot. But far more prominent than Hubbard was Tom Cruise. Projected on a large video panel, his image dominated the space: earnest, handsome, dressed in a black turtleneck, looking directly into a camera and apparently giving a testimonial to the faith. What Cruise was actually saying, however, I couldn't tell. His words were almost completely drowned out by the sound of myriad other videos playing simultaneously nearby. The Church of Scientology, unlike other houses of worship, did not invite somber reflection on its beliefs but rather offered a technological wonderland: music videos promoting the group's Youth for Human Rights campaign played alongside infomercials extolling the wonders of Dianetics, which appeared alongside videos and documentary-style reports on the great work of Scientology's "volunteer ministers" at Ground Zero, which played next to a video of Tom Cruise receiving an award for outstanding service. I was escorted into a small screening room to watch the free introductory film. This turned out to be a high-quality, rather long infomercial featuring a cast of ostensibly real people who explained how Dianetics had changed their lives and improved their health dramatically, curing them of ailments ranging from brain cancer to depression. It was fifteen minutes of fantastic and totally outlandish claims, and yet each testimonial was presented in such a reasonable way that in spite of myself, I felt kind of hopeful. After the film, a woman came into the screening room and told me that she'd like me to fill out a questionnaire. Laurie, as she introduced herself, was a matronly woman of about fifty. She began her pitch gently. "Tell me about yourself," she said. "What made you interested in Scientology?" Over the next hour or so, Laurie asked me a series of questions: Was I married? Was I happy? What were my goals? Did I feel like I was living up to my potential? She exuded warmth and was resolutely nonaggressive. And to my amazement, I began to open up to her, telling her about my relationship with my boyfriend and my desire to quit smoking. In response, Laurie delivered a soft sell for Scientology's "introductory package": a four-hour seminar and twelve hours of Dianetics auditing, a form of counseling that cost $50. "You don't have to do it," Laurie said. "It's just something Iget the feeling might help you." She patted my arm. Laurie also had me take the two-hundred-question Oxford Capacity Analysis, Scientology's well-known personality test, which poses such questions as "Do you often sing or whistle just for the fun of it?" and "Do you sometimes feel that your age is against you (too young or too old)?" After looking at my test, Laurie told me that I had "blocks" in communication but was basically confident, though I did seem to suffer from nonspecific anxiety. "These are all things we can help you with," she said, and smiled. "It's really such a good thing you came in," she added, as she took my credit card. "You'll see." On Monday, I returned to the church to begin my $50 package. My partner in auditing was named David. Sitting down across from me, he asked me to "relive" a moment of physical pain. "Don't choose something that's too stressful," he suggested. I closed my eyes and concentrated, but try as I might, I could not relive much of anything. After fifteen minutes, I gave up. Waiting just outside the room was Jane, a Scientology registrar who told me she was now handling my "case." A redhead dressed in jeans and a lightweight blouse, she asked me how it went. "I'm not sure this is for me," I told her. 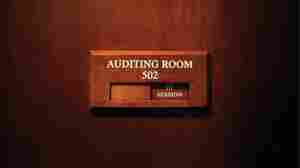 "A lot of people feel that way when they first start auditing; it's not unusual," Jane said soothingly, all the while steering me away from the exit. She walked me down a long hall and into her office, where, on her desk, lay the results of my personality test. Jane studied them a bit. "What you need is something more personal," she said. She suggested Life Repair, a $2,000 package of one-on-one private auditing sessions, which she said would help me handle my everyday problems. Then, after I finished Life Repair, which could take a month or so, I could get right to The Bridge to Total Freedom, which, Jane explained, was how people really made gains, or had "wins," as she called them. "How much do you think people spend on psychotherapy?" Jane asked me. I replied that it varied: in New York, $150–$250 could be standard for a forty-five-minute session. Auditing, she said, was much cheaper. Auditing sessions were sold in 12.5-hour blocks, known as intensives; one intensive, she said, cost $750 — half the price of therapy, hour for hour. "It's worth it, I promise you," she said. "I'll think about it," I told her. Jane seemed disappointed. "We should get you going as soon as possible," she said. "I really want you to have a win." Scientology — the term means "the study of truth" — calls itself the "fastest-growing religion in the world." Born in 1954, the group now claims millions of members in 165 different countries and eighty-five hundred Scientology churches, missions, and outreach groups across the globe. Its holdings, which include real estate on several continents, are widely assumed to be worth billions of dollars. Its missionaries, known as "volunteer ministers," tour the developing world and are sent, en masse, to deliver aid in familiar disaster zones such as earthquake-ravaged Port-au-Prince or New Orleans after Hurricane Katrina. Wherever large groups of people are circulating — in city centers, on street corners, in subway stations, at shopping malls, and on college campuses — you can find Scientologists offering free "stress tests" and distributing leaflets. Like members of another homegrown American faith, the Church of Jesus Christ of Latter-day Saints, Scientologists live in virtually every major city in America and in numerous smaller cities and suburbs as well; they can be found in every age group and vocation. Each year, according to the church's estimates, fifty to sixty thousand people sign up for a Scientology course or buy a book about the faith for the first time. Take a look at these statistics, and you might easily assume that Scientology is one of the most successful new religious movements in America. Certainly it is among the most recognizable, thanks to its most famous, not to mention outspoken, member, Tom Cruise. The creation of the late science fiction writer L. Ron Hubbard, Scientology is considered by some academics within the field of comparative religion to be one of the most significant faiths born in the past century. But type the word Scientology into Google, and it becomes immediately clear that it is also America's most controversial religion. It has been referred to as a "cult," a "dangerous cult," and an "evil cult." There are websites declaring that "Scientology kills" and "Scientology lies." Others are dedicated to exposing Scientology's "secret documents," its "secret teachings," and "what Scientology won't tell you." On message boards, former members post stories about their "escape" from the Church of Scientology, their "recovery" from the Church of Scientology, and their "life after" Scientology. It is a church that, over the past fifty years, has been the subject of more than half a dozen wide-scale government investigations around the world, and thousands of lawsuits, many of which center on its controversial doctrine and practices. Scientology, as its critics point out, is unlike any other Western religion in that it withholds key aspects of its central theology from all but its most exalted followers. This would be akin to the Catholic Church telling only a select number of the faithful that Jesus Christ died for their sins. Whether or not Scientology is a religion is a matter of enduring debate. In Germany, where the church has been described as a "totalitarian" organization, Scientology has been roundly condemned as a cult, and its members have been barred from holding public office or even joining some political parties. In Great Britain, Scientology is also viewed as something other than a religion, but it is nonetheless protected by a statute that criminalizes hate speech and threatening actions directed against religious groups (in May 2008, for example, a fifteen year-old boy was arrested in London for holding a picket sign denouncing Scientology). Australia banned the practice of Scientology in the 1960s but reversed this decision and recognized it as a religion in 1983; yet one outspoken member of the Australian government, Senator Nick Xenophon, has denounced Scientology as a "criminal organization." The French Church of Scientology has been under investigation for more than a decade. In October 2009, a French court found Scientology guilty of fraud and imposed a fine of nearly a million dollars. But the judge stopped short of banning Scientology from France, as the prosecution had requested. Scientology celebrated this decision as a victory. "I don't think that's going to have any lasting impact," the former inspector general of the Church of Scientology, Marty Rathbun, told a Canadian radio interviewer, in response to the verdict. The fine, he explained, was "like chump change" to the church. Excerpted from Inside Scientology by Janet Reitman. Copyright 2011 by Janet Reitman. Reprinted with permission of Houghton Mifflin Harcourt.